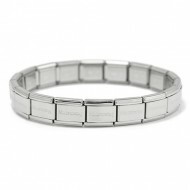 Composable Classic Base Bracelet in stainless steel with 13 Links. This bracelet is known as a base bracelet and is the first step to creating your charm bracelet. You will need extra spare links or some charms to make up your bracelet. As a guide women need 18 links and men 21 links in total. Please add extra spare links to this bracelet as required.